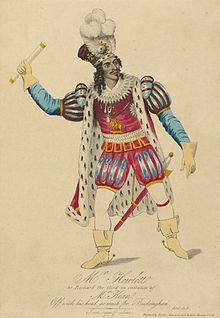 James Hewlett as Richard III in a c. 1821 production. The African Grove Theatre was a theatre founded and operated by William Alexander Brown a free black in New York City in 1821. He was from the West Indies. This was six years before the final abolition of slavery in New York state (gradual abolition brought it to an end in 1827, but young people born to slave mothers had to serve apprenticeships to age 21.) The African Grove Theatre was attended by "all types of black New Yorkers -- free and slave, middle-class and working-class" along with others. It was the first place where Ira Aldridge, who would later become an esteemed and renowned Shakespearian actor, first saw a production of a Shakespeare play. For some years, the African Company—the company of the African Grove—played with a black cast and crew to mostly black audiences. It was the third of at least four attempts to create a black theater in the city, and the most commercially successful. After a few years, city officials shut down the African Grove, because of complaints about conduct: conduct that was normal among working-class white New York theatre audiences of the time was considered unacceptably boisterous when displayed by blacks. One source says that the theatre was "mysteriously burned to the ground in 1826", but it appeared to have failed financially well before that. "There are no records of the African Grove Theater after 1823." The theatre was founded by William Alexander Brown, a pioneering actor and playwright from the West Indies. He had worked as a ship's stewards at times. Through his work as a ship's steward, he traveled to England and the Caribbean, so he had a broader opportunity to see theatre than the typical New Yorker. The West-Indies-born Brown left a job on a Liverpool ship and bought a house in New York, at 38 Thomas Street. At the start, Brown held performances of the African Grove in his back yard, where he offered food and drink, but also poetry and short drama pieces. At the suggestion of James Hewlett, both an entertainer and a regular customer, together they hired other black actors. The theater's repertoire drew heavily on Shakespeare, with comic entr'actes. White audience members were confined to a separate section because, in the words of the theater's management, "whites do not know how to conduct themselves at entertainments for ladies and gentlemen of color." The most popular plays were Richard III and Othello. James Hewlett was the first black man of record to play the leading role in Othello. As was common at the time, the producers adapted Shakespeare's plays. Small casts and smaller budgets required expedients such as that described by the reviewer George Odell, writing of an 1821 performance of Richard III: "A dapper, wooly haired waiter at the City Hotel personated the royal Plantagenet in robes made up from discarded merino curtains of the ballroom. Owing to the smallness of the company King Henry and the Duchess were played by one person, and Lady Anne and Catesby by another. Lady Anne, in Act III, sang quite incongruously." The scholar Laura V. Blanchard identifies Odell's "dapper waiter" as the actor James Hewlett. Frequently harassed by the police, and facing increasing hostility from the white populace, the company moved several times, from Thomas Street north to Bleecker and Mercer Streets. At the time this was the edge of the developed parts of New York City. When Brown moved his theatre from 38 Thomas Street to Bleecker and Mercer Streets, he had a dilemma. Realizing that his theatre now was located too far from its core audience ("free persons of color"), he constructed a theatre building which was near an oft patroned white theater called the Park Theatre. When the Park Theatre—New York City's leading theater of the time— put on Richard III starring the English tragedian Junius Brutus Booth, the African Company rented a hall next door for its own production of the same play the same night. Theatrical competition was stiff; Stephen Price, owner of the Park, orchestrated (and paid for) a disturbance over the rival productions so that the police would shut down the African Grove. In addition to Shakespeare, the African Company performed original works, which included William A. Brown's now-lost play, The Drama of King Shotaway. It was about a 1795 Black Carib revolt against British Navy forces on the island of Saint Vincent. Produced by the African Company in 1823, Drama is believed to have been the first full-length play by a black American performed in the United States. Despite the frequent changes in location and its short period of productions, the African Grove Theatre was important as a venue for noted African-American actors, such as James Hewlett. ^ a b c d e Hatch, James V., and Ted Shine. Black Theatre USA: Plays by African Americans: The Early Period, 1847––1938. New York: Free, 1996. 1. Print. ^ a b c Lott, Eric. Love and Theft: Blackface Minstrelsy and the American Working Class, New York: Oxford University Press, 1993, p. 44. ISBN 0-19-507832-2. ^ a b c d e Gonzalez, Anita & Granick, Ian. "Web Lecture #2: African Grove Theater", African American Performance. Accessed December 6, 2005. ^ Gary Jay Williams, "Review of Errol Hill, 'Shakespeare in Sable: A History of Black Shakespearean Actors'", Shakespeare Quarterly, 1986, accessed October 15, 2010. ^ Odell, George. National Advocate, September 21, 1821, cited by Gonzalez & Granick. ^ a b c d e Laura V. Blanchard, "Review of Carlyle Brown's 'The African Company Presents Richard III'" Archived March 12, 2005, at the Wayback Machine, Richard III Society, December 1995, Accessed August 14, 2005/October 13, 2010. Brown, Carlyle, The African Company Presents Richard III, New York: Dramatists Play Service, Inc., 1989 and 1994, available for preview on Googlebooks. Dewberry, Jonathan. “The African Grove Theatre and Company.” Black American Literature Forum, 16 (1982): 129. Gonzalez, Anita, and Ian Granick. "African Grove Theatre". N. p., 2001. Web. March 4, 2011. Hill, Anthony D., and Douglas Q. Barnett. Historical Dictionary of African American Theater. 1st edition. Plymouth: The Scarecrow Press. Inc., 2009. Hill, Errol, Shakespeare in Sable: A History of Black Shakespearean Actors, Amherst, MA: The University of Massachusetts Press, 1984. Hill, Errol G., and James V. Hatch. A History of African American Theatre. 1st edition. Cambridge University Press, 2003.